The evening skies of winter bring one of the most familiar groupings of stars, Orion, known as a giant, hero, or hunter in cultures throughout history and visible at some point of the year from every inhabited portion of the globe. Orion carries within it several stunning sights for both the naked eye and telescope observer, and we’ll be focusing on this constellation both this month and next. In this column I’ll start with a naked eye orientation to the bright constellation, and next month we’ll zoom in on some of the features visible through a telescope. Orion rises in our evening winter skies as a tilted hour-glass figure marked by brilliant stars. At the beginning of the month he’s well over the horizon in the east by 8:30; by the end of December he’s nearly halfway up the sky in the evening. Two stars mark his shoulders, three his belt, and two his knees. Fainter stars trace out his head, sword, and shield or club he holds extended to the west. Each of the bright stars would be remarkable on their own, but together they make the constellation impossible to miss and twinkle fiercely low in the sky on crisp cold evenings. The two stars marking Orion’s top shoulders are Betelgeuse (reputed to be a corruption of the Arabic for “Armpit of the Giant”) and Bellatrix (of recent Harry Potter fame—ask a fan what other characters appear in the winter sky). Betelgeuse has an unmistakable pale orange hue, which flickers beautifully when it’s low in the east. The stars in Orion present a snapshot of stellar evolution, and Betelgeuse is the old man in the crowd. Betelgeuse is a dying star, a red supergiant near the end of its life. During this period of a star’s life it balloons to enormous sizes and can go through periods of instability, its tenuous radius heaving in and out like a slowly beating heart. Betelgeuse is thought to range from a radius of 800 million miles down to 480 million miles, which means at its smallest its surface would still extend beyond the orbit of Jupiter if it took our Sun’s place in our own solar system. Its density though is so low it’s less than a ten-thousandth of the density of the air we breathe, literally a “red hot vacuum.” It’s bleeding off this thin outer atmosphere into space, a dying giant lying just over 500 light years from Earth. 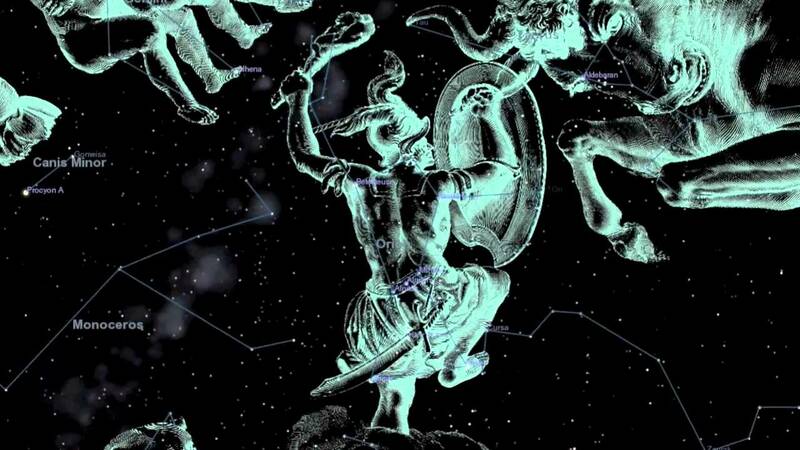 It’s fitting Orion is known as a giant in mythology, because the constellation is full of them. The star marking Orion’s knee opposite Betelgeuse, and providing a bright white-blue contrast to Betelgeuse’s pale orange glow, is Rigel. Rigel is one of the most luminous objects in the entire galaxy, outshining our own Sun by a factor of tens of thousands and at a distance from us of about 750 light years. Though it’s a supergiant like Betelgeuse and therefore has left the “middle age” that characterizes stars like our Sun, it’s younger than the pale orange star. And because more massive stars age more quickly, it’s likely younger than our Sun as well. Supergiants like Rigel (thought to be about fifty times the size and mass of our Sun) live short, hot, bright lives. The stars in Orion’s belt, going from west to east, are Mintaka, Alnilam, and Alnitak. The star marking the remaining (eastern) knee is Saiph (meaning “Sword” though it’s far from the region of the constellation known as the Sword of Orion). All of these stars are giants or supergiants as well. What makes Orion such a rich area in space for the formation of these bright, young stars? The answer is the huge clouds of nebulosity that spread throughout this entire constellation, dark and invisible. Though hundreds of times emptier than the best vacuum we can produce on Earth, these clouds stretch for hundreds of light years and contain enough mass to form thousands of Sun-sized stars, as well as a fair amount of giants. And that’s exactly what has been happening for millions of years in this portion of the sky. 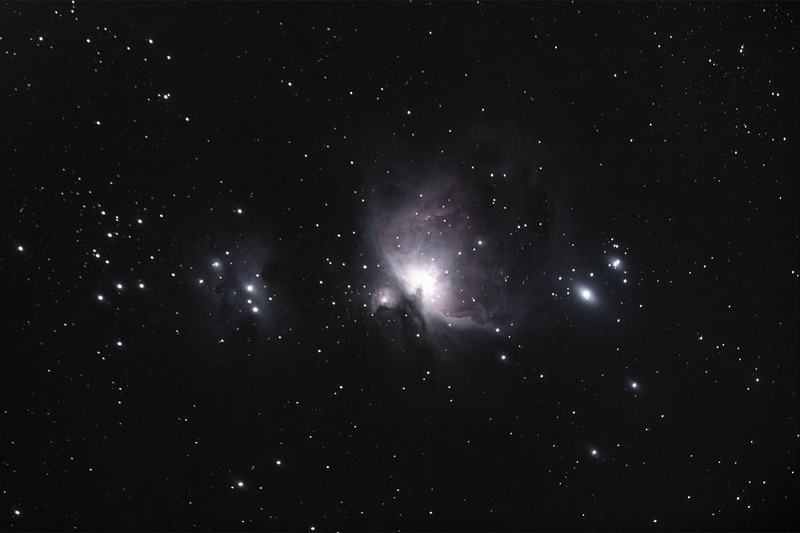 We can see it in action in the visible part of the cloud, known as the Orion Nebula, a fuzzy smear of light in the center of Orion’s Sword, just below his belt. We’ll zoom in on this nebula with a telescope next month, but a good pair of binoculars also offers quite a view. In the center of the nebula a tight grouping of four very young stars, known as the Trapezium due to their shape, are causing the surrounding nebula to glow. These gems at the center of the nebula are among the youngest stars visible in the sky, a scarce handful of millions of years old. The nebula that surrounds them is one of the most famous sights in the night sky. Though it lacks the intense color and detail you’ll see in processed images from large telescopes, it’s still quite impressive for backyard scopes. The astronomy Robert Burnham, Jr., quotes the journalist and astronomer C. E. Barns as saying, “For who would acquire a knowledge of the heavens, let him give up his days and nights to the marvels of Orion. Here may be found every conceivable variation of celestial phenomena: stars, giants and dwarfs; variables, multiples; binaries visual and spectroscopic; clusters wide and condensed; mysterious rayless rifts and nebulae in boundless variety, with the supreme wonder . . . at its heart—the Great nebula.” I tend to agree. Now that we’ve introduced the constellation, next month we’ll take a closer look at what Orion reveals to backyard telescopes. This column first published in the Kankakee Daily Journal. This entry was posted in Writings and tagged astronomy, constellations, Kankakee Daily Journal, Orion, Skywatch on December 19, 2015 by boldsaintcroix. This month starts with us relaxing our clocks back into a more natural rhythm with the Earth’s diurnal cycle, as we conclude Daily Saving Time the first Sunday of November and fall back one hour to Standard Time. This means our evenings get darker sooner, and the stars come out earlier for sky-watchers. It also means clock noon and solar noon once again roughly coincide. With evening arriving earlier, this month we’ll continue our series of looking more closely at sky objects that can be seen through sidewalk telescopes even from the streets and backyards of Kankakee. The bright planets are still mostly grouped in the pre-dawn sky, but evening begins with the constellation Cassiopeia high in the northern sky. This recognizable, easy-to-find constellation hosts a pair of impressive multiple-star systems. Nearby are some lovely clusters and the famous Andromeda Galaxy (often unfortunately washed out by the light pollution in the skies above town). 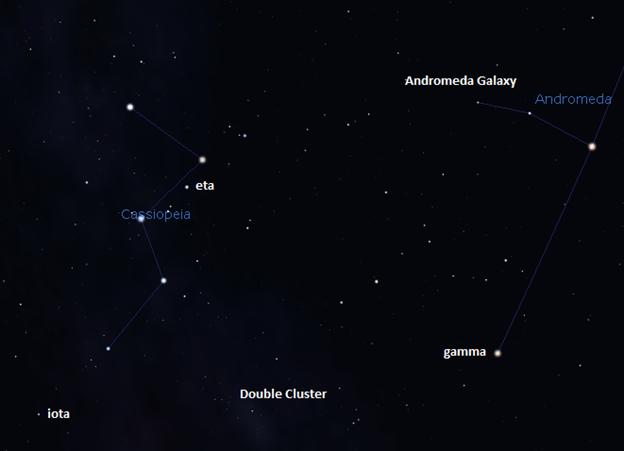 Cassiopeia is shaped by turns as a 3, a W, an E, or an M depending on its orientation in the northern skies. In the early evening skies of November, it looks like an angular number 3, its bottom pointed down toward the northeast, with five bright stars marking the ends and each angle of its zig-zag shape. Once you’ve tried your hand at finding and viewing η Cassiopeiae, the next target in Cassiopeia is ι (iota) Cassiopeiae, a moderately bright star just below the constellation’s southernmost “zag.” Drawing a line through the southernmost two stars of Cassiopeia’s zig-zag, extending again about as far as the distance between the stars, will get you there. 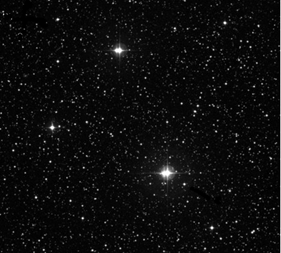 Through a telescope, ι Cassiopeiae will look like a smaller version of η Cassiopeiae. In fact though, it’s not a double but a triple system, with the brighter component actually itself a very close double star. Under high magnification and clear viewing, you may be able to just barely spot a small blue companion close to the yellow primary star. This entire triple system is about 160 light years from Earth. If we go east from the bottom of Cassiopeia, toward the constellation Perseus, we’ll run into the Double Cluster (NGC 869 and 884). Visible with the naked eye in dark skies, these have to be “felt out” in brighter city skies. Once spotted though, they’re still an impressive sight. They are best viewed at lowest magnification in the telescope (or even with a pair of binoculars) and are examples of open or galactic clusters, composed of hundreds of young (six to twelve million years old) stars seven thousand to eight thousand light years away. In the telescope eyepiece they fill the view with dozens of bright, crowded stars. Now, leaving the best for last (and omitting the fabulous Andromeda Galaxy which is nearby but washed out in city skies), we move to Almach, also known as γ (gamma) Andromedae, to the southeast of Cassiopeia, marking one of the feet of the constellation Andromeda. Almach is one of the most impressive double stars in the sky. Its component stars are a bit closer together than those of η Cassiopeiae but they have a brilliant, sharp color contrast between the yellow/gold primary and the dimmer blue companion star. Like ι Cassiopeiae though, one of the components of Almach (the dimmer blue star) is itself a close double as well, though I have not been able to separate these components in my backyard telescope. It doesn’t stop there though: one of those stars is in addition an even closer binary star with a period of only three days, making the whole system actually a quadruple star system. I occasionally hear that the early evenings of autumn make people feel winter is finally here and sometimes even lead to seasonal doldrums. I maintain though that darker, earlier evenings are a fantastic opportunity to get out and learn about the dynamic, tangled lives of those bright stars above us. Hopefully these objects give you a place to start! This column appeared first in the Kankakee Daily Journal. This entry was posted in Writings and tagged astronomy, binary stars, Cassiopeia, constellations, double stars, Kankakee Daily Journal, stargazing, stars on November 7, 2015 by boldsaintcroix. When I talk to people about observing here in town, they often bemoan the fact that light pollution makes stargazing all but impossible from within the city limits. Though it is true that observing from an urban setting doesn’t compare to an experience under truly dark skies, it’s certainly not the case that there’s nothing to see from one’s own backyard or even sidewalk.This month I’ll consider some of the sights in the constellation Lyra, which is almost directly overhead throughout August in early evening. Lyra is a tiny constellation, but it holds a wealth of lovely double stars that are bright enough to be seen without a pilgrimage to the deep, dark countryside. The constellation Lyra is easy to find on clear nights. Vega, its brightest star and the brightest star of summer, is nearly overhead at sunset. Vega marks one apex of the famous Summer Triangle, an asterism of three bright stars high in the summer skies. Lyra itself though is small formed of a triangle of stars attached to a larger parallelogram. Classically, the constellation was seen as a harp or lyre. Sometimes you want higher magnification, as when you’re viewing the planets or the Moon and want to see details, but for the following views a lower magnification is better. Start your tour with Vega, especially if you’re new to stargazing. A single star doesn’t look much different through a telescope, but this will give you a chance to align your finding scope (if your telescope has one) and test your instrument’s focus. It will also give you an idea of the seeing conditions for the night. If you can focus Vega down to a brilliant, sharp point, and if you can see one or two of its dimmer companions in your telescope’s field of view, you should be able to spot the rest of the objects in this list. 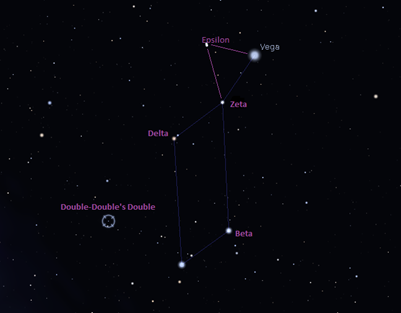 Hop down from Vega to Zeta Lyrae, the dim star where the triangle meets the parallelogram. This is one of the many double stars in Lyra. Double stars are great targets for light polluted skies. Unlike nebulae or galaxies, they are fairly bright and thus easy to enjoy even from one’s own backyard. Through even a small telescope, Zeta Lyrae is revealed to be a wide, uneven double, and many observers report seeing a beautiful color contrast between the component stars. Moving up to the third star of the tiny triangle that makes up the top portion of Lyra, we find Epsilon Lyrae, one of the most popular double star systems in the sky and an example of why some observers (like me) get so excited about double stars. At 40x you may simply see what looks like a wide pair of white stars. But if you increase your magnification (I used 130x), you’ll see that each of these stars is actually itself a pair of stars. The entire system is known as the “Double-Double.” You’ll need a steady eye and good seeing to split them, but you’ll know if you’ve succeeded by noticing the orientation of each tight pair: they’re inclined at ninety-degrees to each other. Moving back to a lower magnification, each of the stars at the apexes of Lyra’s parallelogram is a treat. Delta Lyrae is a wide double star in a diffuse cluster of stars. One of the components is a lovely orange in contrast to the surrounding blue stars. But my favorite sight of all in Lyra is a bit off the beaten path and not terribly well known. It’s sometimes called the “Double-Double’s double,” but I think it’s actually nicer than the more famous Double-Double. It’s a pair of double stars, like the Double-Double, known as Struve 2470 and 2474. They’re dimmer than the pair that make up Epsilon Lyrae, but because the components are farther apart they’re easier to split. They also have more marked colors, the brighter components appearing yellow in contrast to the dimmer bluish companions. Moreover, by some cosmic coincident the pairs are orientated in the same direction so they indeed look like almost perfect twin double stars in a single telescope eyepiece. This view alone would be proof enough for anyone who says the city skies are too bright to hold telescopic wonders. Struve 2470 and 2474, the “Double-Double’s Double,” image from bestdoubles.wordpress.com. This entry was posted in Writings and tagged astronomy, column, constellations, Daily Journal, double stars, doubles, Lyra, Skywatch, skywatching, stargazing on August 15, 2015 by boldsaintcroix.